The benefits of building the system yourself. We've seen it countless times. A technology company enters the market with a bang, throwing established industries into chaos and forever changing the lives of everyday people -- and then a scandal breaks and the founder or CEO is publicly ousted. Uber co-founder Travis Kalanick was kicked out as reports of the company's sexist culture flooded the news; Equifax CEO and chairman Richard Smith suddenly decided to retire amid a data breach affecting more than 140 million people; Theranos founder Elizabeth Holmes was charged with fraud by the SEC, forced to give up control of her business and barred from serving as the leader of a public company for 10 years. Even Yahoo CEO Marissa Mayer couldn't keep a job during the Verizon acquisition, following a series of security scandals, including a hush-hush hacking campaign that hit billions of accounts. So it would seem the writing is on the wall for Mark Zuckerberg, the founder, CEO and chairman of Facebook. His company is at the heart of a massive political and data-security scandal, accused of turning a blind eye as British political-consulting firm Cambridge Analytica collected information from 50 million Facebook users without their consent. That information was then piped into Donald Trump's successful campaign for president. This isn't Facebook's first brush with large-scale privacy concerns, but the political implications have made the scandal mainstream news. Shareholders and Facebook users have filed lawsuits against the company; Mozilla, Tesla and other major organizations have pulled their ads and pages from the site; Congress wants Zuckerberg to testify; and the Federal Trade Commission is investigating the company's privacy practices. However, Zuckerberg doesn't appear to be worried about his position at Facebook. He's completed the expected apology tour, publishing a Facebook post about the issue, participating in interviews where he reiterated his written sentiments, and finally appearing on CNN to say the same things yet again, but this time, on-camera. He's appeared appropriately calm, concerned and confident, and not once has he had to answer questions about his own job security. There may be a hashtag to #DeleteFacebook, but there are no rallying cries to #FireZuckerberg or otherwise see him step down. This is because Zuckerberg is uniquely insulated at the top of the company, with no one truly able to force his hand in any direction. The same reason he should be held responsible for Facebook's gross mismanagement of user data is also the reason he isn't sweating over his role -- Zuckerberg is the king of Facebook. It's nearly impossible to exile him. Facebook is a public company, which means it has a board of directors representing the stockholders. Traditionally, when a CEO is forced out of their public company, it's because the board voted to get rid of them -- each member owns a different percentage of shares and thus a different percentage of the vote, giving some folks more power than others. But, if a majority vote the same way, the motion passes. As chairman of the board, Zuckerberg controls 87 percent of Facebook voting shares. Even if the remaining eight board members wanted to kick him out, they don't have the power to do so, unless Zuckerberg decides to play along and vote himself out. This consolidation of power didn't happen by accident. In December 2015, Zuckerberg pledged to give away 99 percent of his Facebook shares -- valued at $45 billion at the time -- to fund the Chan Zuckerberg Initiative, a charitable organization he founded with his wife. In order to do this without reducing Zuckerberg's majority on the board, Facebook took a page of out the Google founders' handbook. It planned to introduce a new type of non-voting stock, Class C, that would split every share for every stockholder into three distinct shares. A share worth $100 would be transformed into three $33 shares, two of which would be Class C, meaning they wouldn't carry any voting rights. Zuckerberg controls 87 percent of Facebook voting shares. This would have allowed Zuckerberg to divest 99 percent of his shares without giving up control of the board. When Google did this same thing in 2014 to protect the status of founders Larry Page and Sergey Brin, shareholders weren't too pleased with the plan -- just 12.7 percent voted to pass it. Page and Brin used their majority to push it through regardless. Facebook drew ire for its Class C plan, too. In February 2017, a proposal to oust Zuckerberg as chairman gained traction among shareholders, with the Class C changes cited as proof of his unchecked power. And in September, Zuckerberg backtracked on the Class C plans. In a Facebook post, he wrote, "Facebook's business has performed well and the value of our stock has grown to the point that I can fully fund our philanthropy and retain voting control of Facebook for 20 years or more. As a result, I've asked our board to withdraw the proposal to reclassify our stock -- and the board has agreed." However, a few upset shareholders can't get rid of Zuckerberg -- and besides, the board doesn't seem to want that. 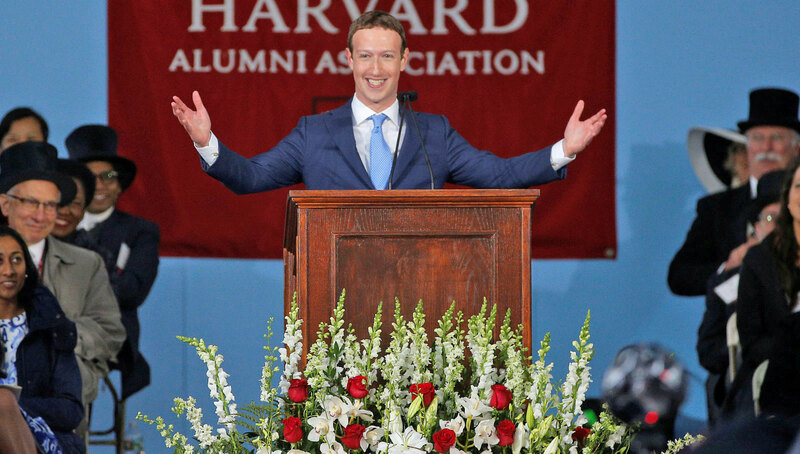 Aside from Zuckerberg, the Facebook board includes eight people, all of whom have high-profile histories in tech entrepreneurship: Peter Thiel, Jan Koum, Reed Hastings, Susan Desmond-Hellmann, Kenneth Chenault, Erskine Bowles, Marc Andreessen and Sheryl Sandberg. These folks are generally happy with the way Zuckerberg runs Facebook as a business. Even after the Cambridge Analytica scandal wiped out about $100 billion from Facebook's market capitalization, the company is still worth about $440 billion. Facebook earned a record $12.97 billion in revenue just in the final quarter of 2017, despite the fact that people are spending less time on the site. Zuckerberg has proven himself to be a capable leader in times of crisis, navigating the site through fake news debacles, questions over its political influence and previous privacy concerns. Zuckerberg is doing the same thing with the Cambridge Analytica scandal and board members have no reason, for now, to stop him. Disrupting the Facebook hierarchy would only throw the company into further turmoil. Besides, they're all still making money. Whether at a public or private company, profit is the defining factor when it comes to kicking out a CEO. Uber was bleeding cash at the time of Kalanick's firing, and Yahoo was in such dire straits under Mayer that Verizon requested a $1 billion reduction in its acquisition price. For now, Facebook is still making bank for its board members, meaning Zuckerberg is secure. At Facebook, nothing happens without Zuckerberg's approval. As chairman, CEO and founder of Facebook, Zuckerberg enjoys vast control over the entire company. Even outside of Facebook, in the real world, he's a prominent figure who's been canonized on the silver screen as a hesitant kid genius, idolized by hoodie-wearing computer science majors across Silicon Valley and beyond. Zuckerberg's success has been wrapped up with Americana fantasy, presented as proof that talent and a good idea are enough to make somebody's -- anybody's -- life. But that's all armchair psychology. Perhaps there's no outcry for Zuckerberg's removal because things simply aren't bad enough yet. Maybe if the official number of mined Facebook accounts hits 1 billion, or if more evidence of mishandled data comes to light, public pressure will grow to a fervor that forces him to step aside, for the good of the company's bottom line. For now, though, Zuckerberg is protected by a clean reputation, the dazzle of Hollywood and the company hierarchy that he personally built. At Facebook, nothing happens without Zuckerberg's approval: This includes letting a company like Cambridge Analytica mine Facebook users' data without their permission or firing the CEO. Especially when that CEO is Zuckerberg himself.